It's Wednesday and time for Grant Cunningham's Hump Day Reading List. Links to articles on pepper spray, bugging out in an RV, active shooter's suffering from weapon malfunctions, the latest tactics for car thieves and more. "COMPARISION / CONTRAST: OLD V NEW AR PLATFORMS" (Part 1) (Part 2) -- American Partisan. Part 1 looks at the AR-15/M-16 as it was initially rolled out in the 1960s and 70s. Part 2 looks at what has been improved over the last few decades to produce the rifle/carbine that we all know and love today. SALUTE & SALT are the simplest, best formats I’ve found yet for rapidly sending information. It’s info until it’s developed into something someone can read and make a decision based upon. Once its refined into something we can make decisions to act upon, it becomes intelligence. The more information you can send with your report, also known as a product, the better. We have to know what to look for- for example, a trained observer will look beyond the make and model of weapon itself and look at how its outfitted. "8 Overlooked Bug-Out Bag Items"--Modern Survival Online. The items are: (1) nail clippers, (2) binoculars, (3) a respirator mask, (4) a pair of small scissors, (5) sunscreen, (6) mosquito net, (7) floss, (8) poncho. The author talks about each and provides recommendations, so read the whole thing. On one hand, if Democrats win the House, they’ll take over the Ethics, Intelligence, and Judiciary committees, ensuring constant investigations and subpoenas aimed at impeaching President Trump and fomenting public unrest. They’re going to shackle the president’s agenda far worse than the Republican House did during the Obama administration, and turn Trump into a lame duck president ahead of 2020. If Democrats win the House, impeachment is a near certainty. The Mueller investigation is ongoing and despite months of reporting of its imminent completion, it could still drag on for months. The mood from Democrats right now leads me to believe they’re going to investigate every nook and cranny of Trump Inc., regardless of what Mueller finds. And they’ll have the Mueller findings to help them along. On the other hand, if the Democrats fail to take the House, we’ll see growing calls that, in addition to the sitting administration being illegitimate, the sitting Congress is unrepresentative of the American People. Between the already sporadic violence and how unhinged the far left has become, it’s not outside the scope of possibility that we see organized political violence as a result. There’s a good chance that we see an organized resistance movement develop, beyond the political resistance movement of today. If the mid-terms don’t push the far left over the edge, another four years of President Trump in November 2020 will. Ionizing radiation comes in 5 basic forms. For the sake of simplicity, it is easiest to rate them by what they can and cannot pass through. Ideally, you should be able to detect at least alpha and gamma rays, as they span the range of particles you would need to be most concerned about as someone trying to survive a nuclear event. Alpha carries the least amount of energy. It can be stopped by a sheet of paper. These particles are still very dangerous if swallowed or inhaled. Even alpha particles are the easiest to stop, they are also some of the hardest forms of ionizing radiation to detect. Typically, it will take a conventional Geiger counter to detect alpha particles. There are some DIY explorers that claim they are able to detect this form of radiation with modified photo diodes and transistors. These particles carry more energy than Alpha particles. They can be stopped by aluminum foil, thin boards of wood, and other fairly lightweight material. Beta particles can also be very dangerous if swallowed or inhaled. You are more than likely familiar with these particles because they are routinely used in medical imaging studies. As with other forms of ionizing radiation, they are derived from unstable atoms that break apart and release rays of energy. X-rays cannot penetrate bone or thicker metal plates. Typically, even the thickness of most metal pendants is enough to stop X-rays from passing through. Some talcum powders and other body powders can also stop a good percentage of X-rays from passing into the body. Of all the radiation types that can be released by a nuclear power plant, a nuclear bomb, or from nuclear waste, gamma rays are the most dangerous. They carry a good bit of power and can only be stopped by lead, iron, or other metal shields. Gamma rays can be detected readily enough by photo diodes and other alternative ionizing radiation detectors. Worst comes to worst, this is the form of radiation you should be most concerned with detecting. If you know there is gamma radiation present, and can track the changes in the amount, then you can estimate when beta and alpha particles will also be gone. Since this is one of the three main parts of an atom, it is also one of the most dangerous because other atoms can absorb it and become unstable. Once the host atom becomes unstable, it can also release radiation, or become “radioactive”. Neutrons can only be stopped by large amounts of water, concrete, or other substances that contain a large amount of hydrogen. Bear in mind, however, these substances will also become unstable and release radiation to some extent. Overall, it is not easy to detect neutrons. Fortunately, relatively few are released from an atomic explosion when compared to other particles. Of particular concern, according to the report, are two North Korean satellites currently in polar orbit over the United States. The two satellites, launched in 2012 and 2016, currently travel in trajectories that are "consistent with practice or preparation for a surprise nuclear EMP attack," the report says. The satellites' polar orbits allow them to evade detection by U.S. missile defense satellites and sensors – a sign they could be used during the first stage of a North Korean long-range nuclear attack to disrupt U.S. missile defenses in Alaska and California. The satellites, KMS-3 and KMS-4, appear to be similar to a secret Soviet-era weapon called the Fractional Orbital Bombardment System (FOBS) that Moscow planned for a surprise nuclear attack on the United States over the poles. Two retired Russian generals testified to the EMP commission in 2004 that a design for a Russian super-EMP weapon was transferred to North Korea by Russian scientists and engineers working on North Korea’s missile and nuclear weapons program. The Russians asserted the North Koreans could test a super-EMP weapon in a few years. Last year, after North Korea conducted its sixth underground nuclear test, North Korean state media announced that the hydrogen bomb "can be detonated even at high altitudes for a super-powerful EMP attack according to strategic goals." China's EMP arms were discussed in Chinese military writings as recently as 2016. China's National Security Policy Committee, stated in January 2016 that "electromagnetic pulse bombs" will "change the ‘rules of the game'" by disrupting U.S. military precision warfare capabilities. A PLA air force publication in 2014 states that EMP blasts are a new type of weapon. "On a battlefield, this new-type weapon will cause devastating damage to electronic systems, including computers, communications and control systems, and radars, resulting in immeasurable losses," the report said. Russian military plans for using EMP attacks were traced in the report to Gen. Vladimir Slipchenko and his book Non-Contact Wars that calls for combining cyber attacks, physical attacks, and EMP attacks against electric grids. A Russian General Staff journal in 2011 also stated that U.S. military forces are vulnerable to electronic and EMP attacks. "A single low-yield nuclear weapon exploded for this purpose high above the area of combat operations can generate an electromagnetic pulse covering a large area and destroying electronic equipment without loss of life that is caused by the blast or radiation," the report said. Iranian military writings follow Russia's approach to warfare and the use of EMP. A 2010 Iranian military textbook states that Iran, in a future conflict, is planning coordinated attacks by nuclear and non-nuclear EMP, cyber, and physical weapons to cause blackouts and the collapse entire nations. Iranian military doctrine sees nuclear EMP attacks as the ultimate cyber weapon. Iran also is building defenses against EMP attacks for its infrastructure. The report states that Iran may prefer to use the indirect method of causing mass casualties by using a nuclear EMP attack as a way to conduct nuclear war under Islamic law. Non-nuclear EMP weapons, those that are limited to a range of a mile or less, also have been used to disrupt communications power grids, the report said. North Korea used a radio frequency weapon purchased from Russia to attack airliners and air traffic to Seoul, South Korea. I would note that KMS3 was launched in 2012 and only masses about 100 kg, while KMS4, launched in 2016, masses about 150 to 200 kg. KMS3 was launched before North Korea first test of what it claimed was miniaturized nuclear weapon in 2013. KMS3 has also been tumbling since its launch with no communications detected from it. Thus, it is unlikely that KMS3 contains a warhead and, even if it did, there is no way for North Korea to establish communications with the satellite in order to give it any commands. KMS4 was launched in February 2016, after a January 2016 failed thermonuclear weapon test, but before a successful September 2016 test. Thus, given its mass and timing, it is also unlikely to contain a warhead. Larry Schweikart, a historian and author, is looking at the fact that the Democrats have increased spending in districts that were considered secure and suggests that the Democrats are scared that the Republicans may actually gain seats in both the Senate and the House. (H/t Anonymous Conservative). "The caravan marches on: Migrants resume their journey after taking the day off as Mexico warns there are now 14,000 making their way to the US"--Daily Mail. According to the article, "The first caravan set off from San Salvador last week and crossed through Honduras and Guatemala with relative ease before arriving at Mexico's border with Guatemala on Friday. After briefly clashing with police, they were let through and are now marching north towards the US. The second caravan is now in Chiqimula, Guatemala, and is being bused to the border to catch up with the others." The main group is estimated to be 7,200, but there are an additional 3,000 that have already entered Mexico, 2,000 in the "second" (actually third) caravan now in Chiquimula, Guatemala, and another group of 2,000 who are planning to mobilize in Honduras in the next few days. But that is not all: "Another U.S.-bound caravan takes shape, this one from El Salvador"--NBC News. Yet another article indicates that the 14,000 estimate is just Hondurans and does not include those in the so-called "caravan" coming from other countries. The reality is, people who leave their homes often have good reasons for leaving, and those reasons are not always pretty ones. Crooks often are the first people to leave home for a fresh start, and they're actually a vanguard of sorts in mass migrations. Read anything by Eric Hoffer to understand the key role of the misfit in mass movements and migrations, and this Honduran long march looks like both. Hoffer understood the dynamic perfectly. "'We are workers, not ISIS.' Migrants marching towards US hit back at President Trump saying 'we are fleeing from the same criminals he is complaining about'"--Daily Mail. Mexico has offered them asylum, but only 1,699 have applied for it. We can rule out that they're fleeing due to crime or political problems--they are simply economic invaders. Related: "Gov. Abbott: Migrant Caravan Includes Terrorists From Muslim Nations"--YourNewsWire.com. "Pipe bombs are sent to the Clinton's New York home, the Obama's DC home and CNN's HQ - just days after a similar device was found at billionaire George Soros' property as Secret Service suspect serial attacker"--Daily Mail. This is such an amateurish attempt that I am tempted to consider it a false flag event. The return addresses on all the packages were for Rep. Debbie Wasserman Schultz’s (D-FL) Sunrise, FL, office. This resulted in one package, that was sent to Eric Holder being returned to Schulz's office because the delivery address was wrong. "Bartow PD: Girls planned to attack and kill at least 15 students"--Fox 11. The girls, ages 11 and 12, were armed with a variety of knives and a pizza cutter (!). "The girls admitted to being Satan worshipers and told police they were planning on attacking and killing as many students as possible." "Why Some Scientists Say Global Warming Is Out and Global Cooling Is In"--American Thinker. Because some scientists think that the Sun is more important to global temperatures than man-made CO2. 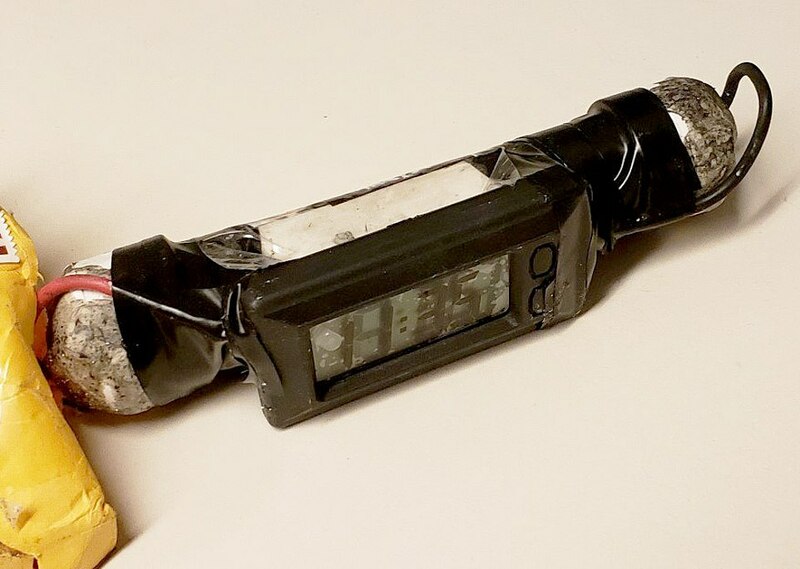 Re: "4 Ways To Make An Ionized Radiation Detector"
I see that Urban Surival Skills at least mentions the Kearny Fallout Meter (KFM), he doesn't provide instructions for how to build one, or provide a link to instructions. Instructions for building the KFM from common household materials is found in the book "Nuclear War Survival Skills" by Cresson H Kearny. This is a well written book that does not assume any background knowledge about radiation or nuclear weapons. A PDF version of the book is available here: https://www.oism.org/nwss/. If you are concerned about a nuclear attack, go ahead and buy the physical book: https://www.amazon.com/dp/1603220941/. A nuclear attack on the US will likely involve one or more nuclear detonations, which will likely create EMP. So, all the discussions about using an Android cell phone or Arduino computer to build instruments to measure radiation may be moot if EMP frys either of those devices. Plus, the middle of a nuclear attack is not the time to launch into an electronics project to build a device to detect radiation. You are realistically going to have to deal with two levels of radiation. First, potentially high levels of radiation if you are downwind from a nuclear explosion. Second, low levels of residual radiation that will still be harmful for a long period of time. Ideally, you need a radiation meter that has both low range and high range scales - these exist but are hard to find. Low range Geiger counters (e.g. the Radalert 50, or one of the many similar Russian products) are readily available on ebay for modest amounts of money - it should be protected from EMP when not in use. High range meters include the old Civil Defense survey meters, but I would not really trust one unless it has been refurbished and tested recently (e.g. from these people: http://www.ki4u.com/). Thank you for the details and links.